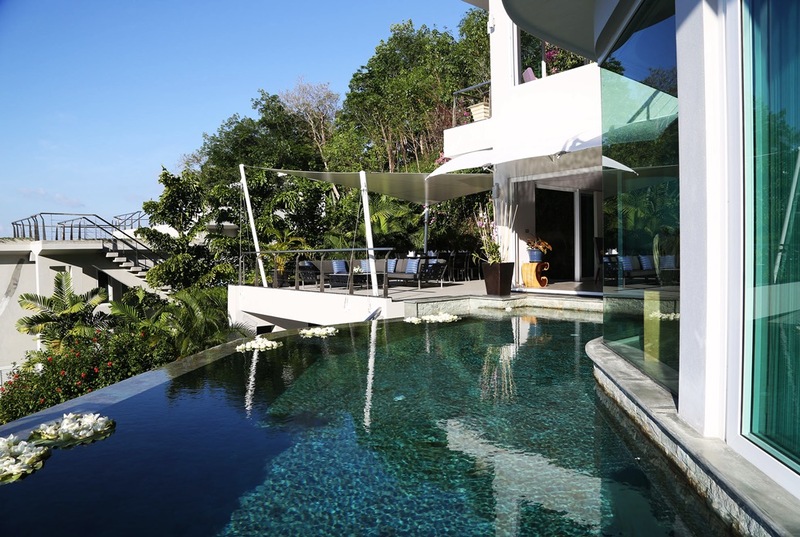 Villa Beyond is enhanced by stylish décor, hypnotic views and tropical birdsong in the garden. 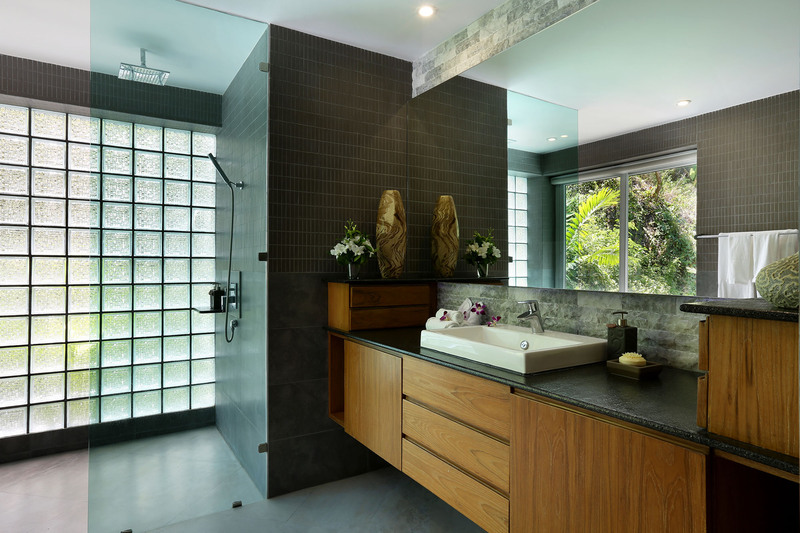 A blend of natural materials results in a simple but beautiful interior, complemented by bespoke furniture artfully created from wood and metal. 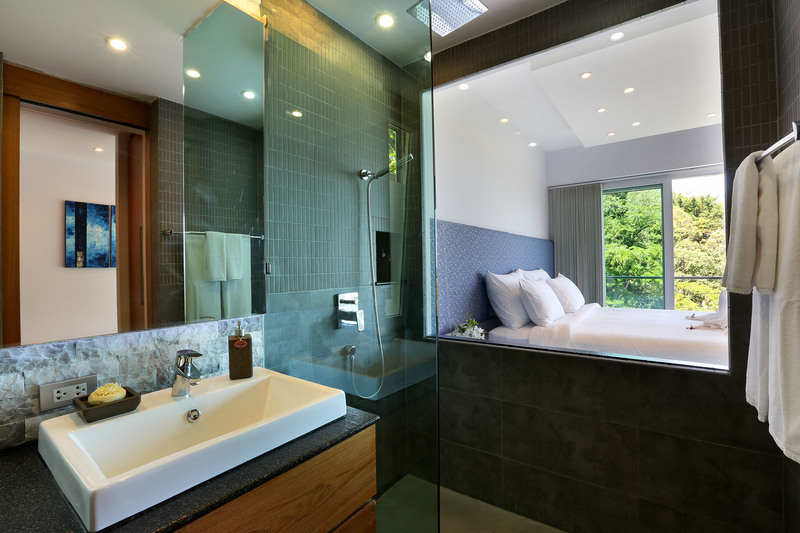 The seven bedroom suites provide discreet hideaways with large, comfortable beds and panoramic views, particularly the master suite with its massive soaker tub and jacuzzi, big enough for two. 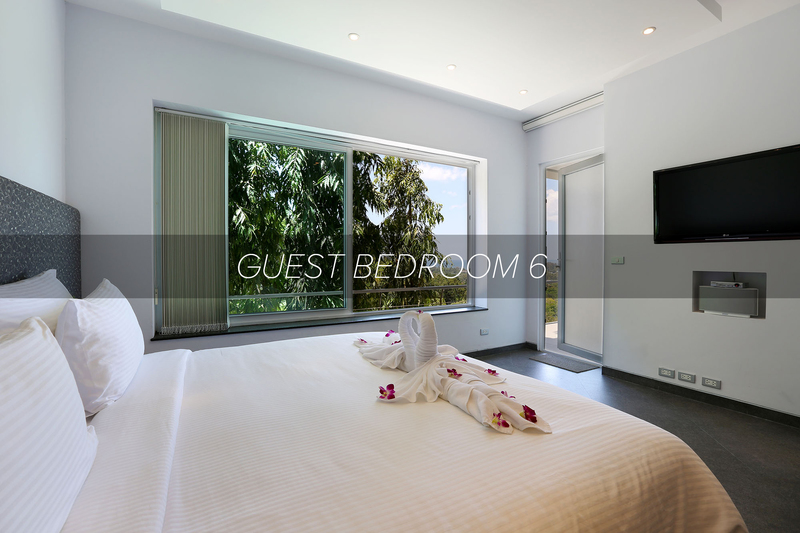 Every bedroom is equipped with a flat- screen TV and sound system. 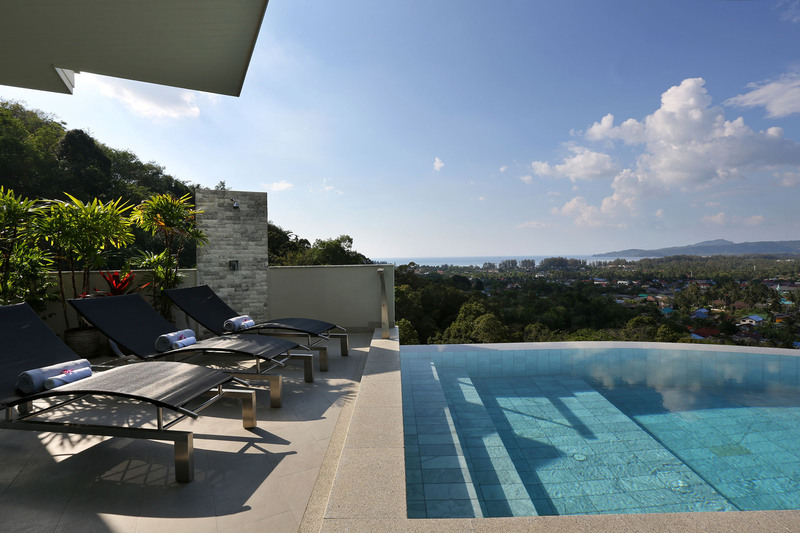 Time at Villa Beyond stands still as days are spent swim ming and sunbathing. A refreshing dip in the infinity pool or a lazy afternoon lounging on the terrace to the sound of the waterfall will soothe away any worries. Enjoy a relaxing breakfast on the sail-shaded outdoor dining terrace, or up on the rooftop where there is noth ing to disturb the peace. 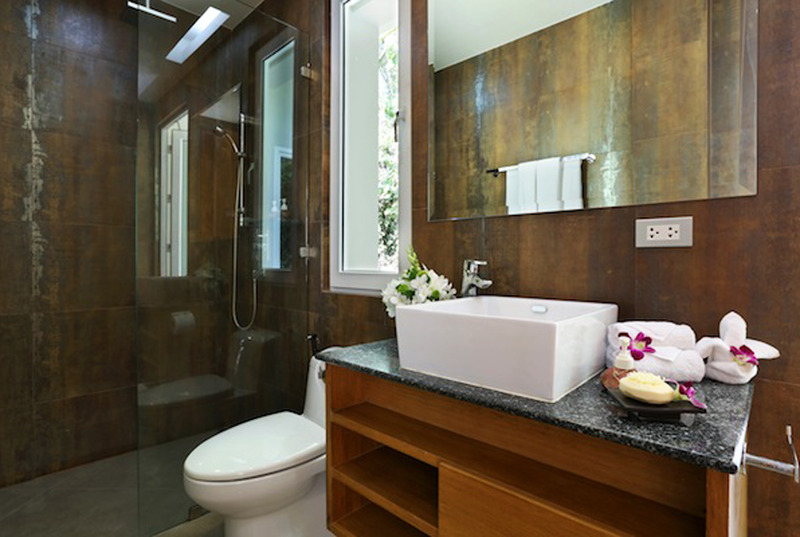 Bliss out with a massage and delight in the delicious Thai dishes prepared by your in-villa chef. As evening falls, the island and ocean view transforms into a vista of stars and twinkling lights, invit ing you to venture out and discover Phuket’s vibrant nightlife. 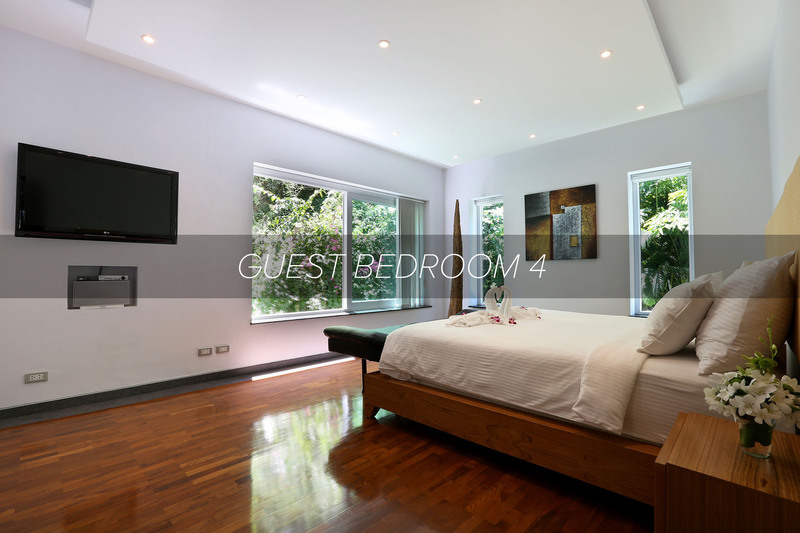 Situated centre stage on the third floor of the villa is the master suite. This is a room designed for romance, and the highlight is a large private sun deck with spectacular island views. 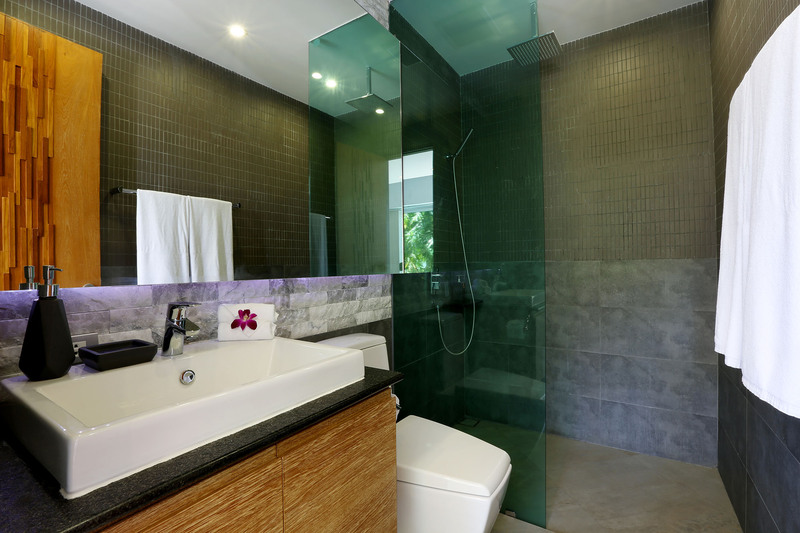 Both the super-com fortable bed and the jacuzzi tub in the ensuite bath room look out towards the ocean. 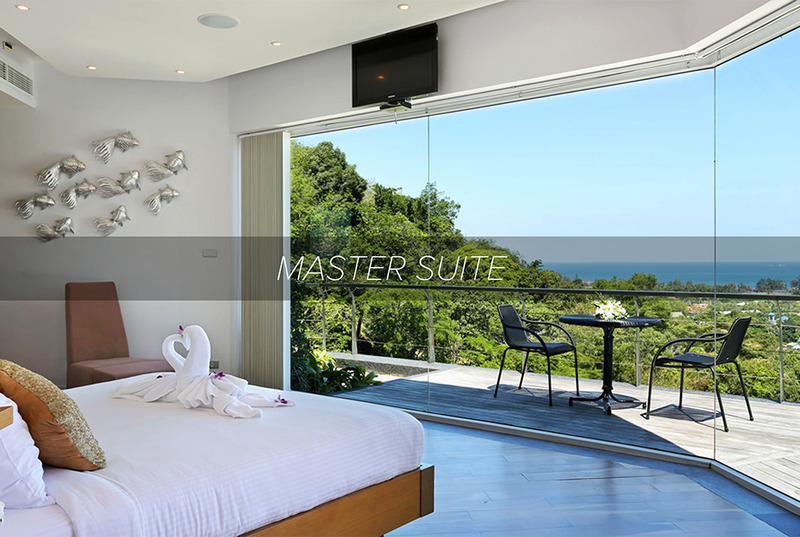 Of the three guest bedrooms on the third level of the villa two are positioned either sider of the master suite and also have private balconies with ocean and island views. 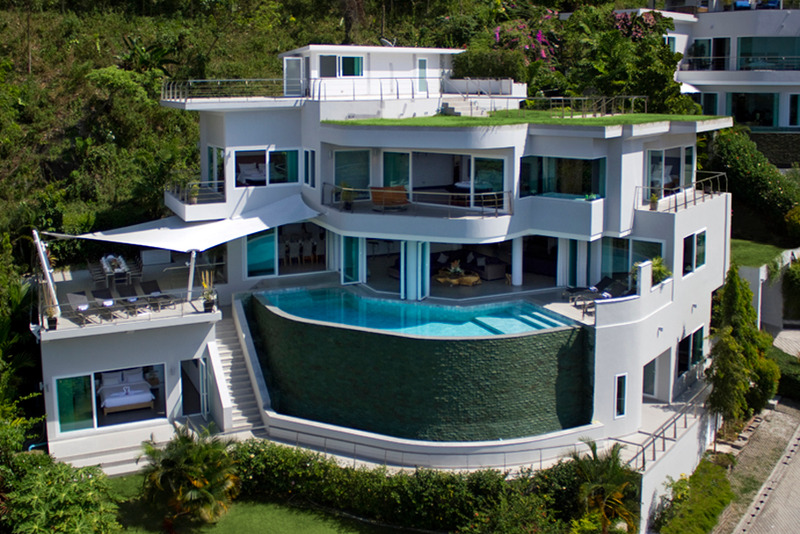 The third is towards the back of the villa and overlooks the green hillside. Each is furnished with a king-size bed and chaise longue and fitted with a his n’ hers closet and ensuite bath room with shower. 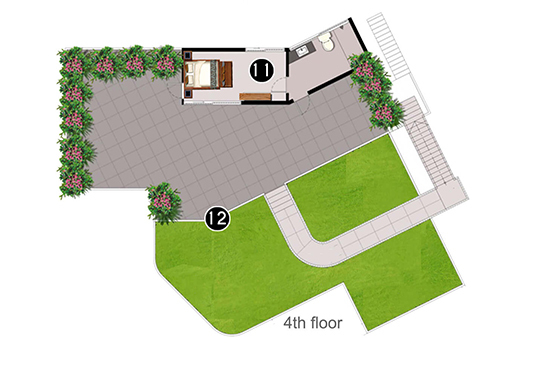 Down on the first level are two guest bedrooms; their discreet location makes them particularly pri vate. 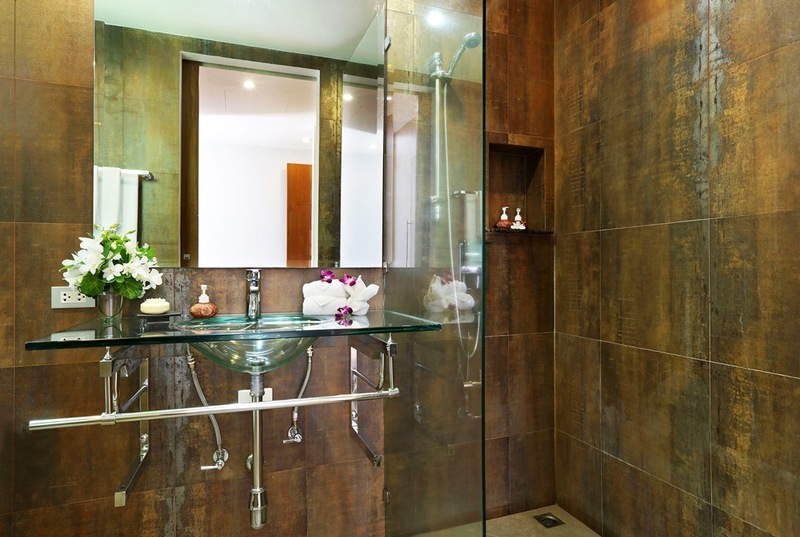 Each has sea and garden views, whilst one room has a soaker bathtub and jacuzzi. Along with breakfast and drinks. A full wine, spirits and soft drinks menu is also available. Guests are encouraged to plan their meals together with the villa chef, ideally a day in advance to allow time to buy groceries and pre pare meals. To cover the grocery shopping costs, guests are asked to provide a cash float in advance, and staff will keep all receipts from their shopping for reference. Food and beverages are billed at the market price with an additional 20% service charge. 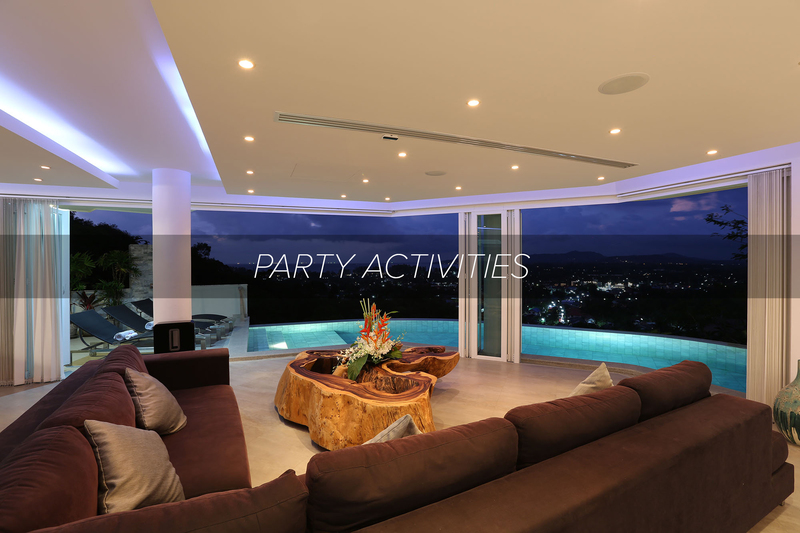 VIlla Beyond activities are tailor-made for a legendary celebration you and your buddies will never forget. 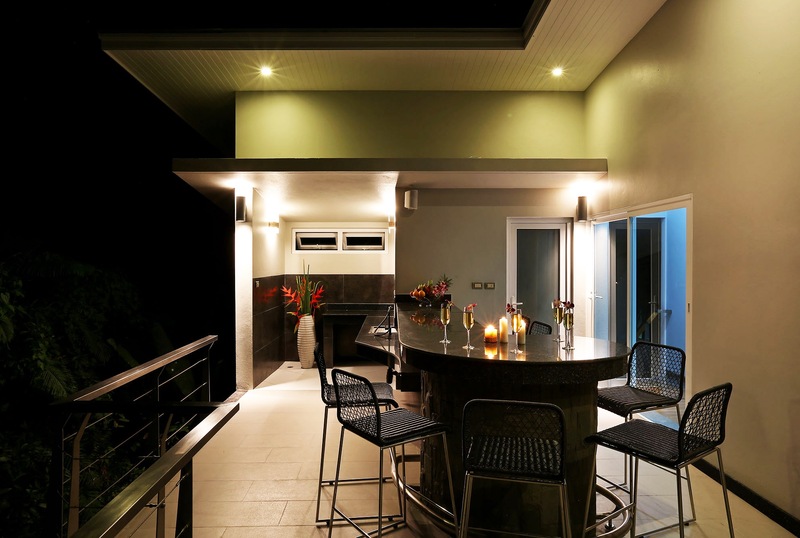 As you prepare for your big night, you can stretch out in a lounger, knock back some beers while relaxing in the pool, or simply take in the stunning views or even make BBQ dinner on the rooftop. 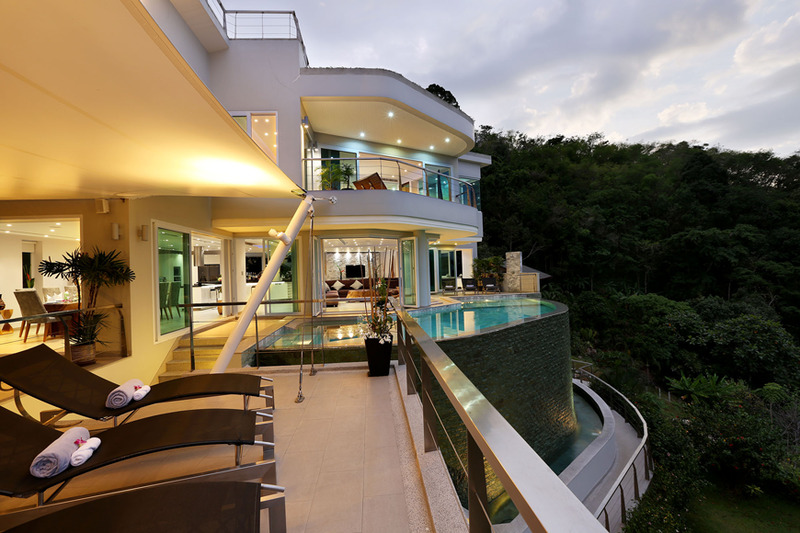 The villa manager is more than happy to assist with any activity planning you might need to make your stay in Phuket unforgettable. 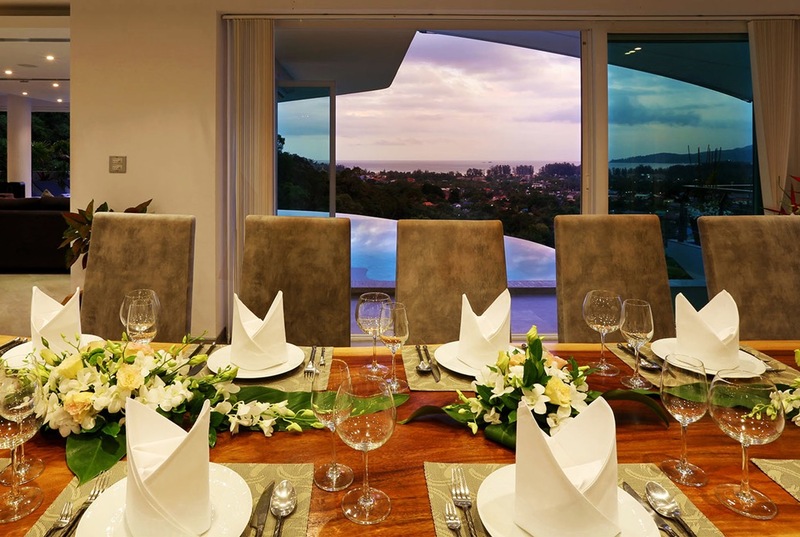 Make the most of the villa chef, who will conjure up kid-friendly dishes for the fussiest of eaters. And having a blender on-site means healthy smoothies and baby food are easily made. Add a healing touch to your stay at Villa Beyond with a soothing in-villa massage or beauty treatment. Check the spa menu for a session. A massage can calm the mind and invigorate the body. 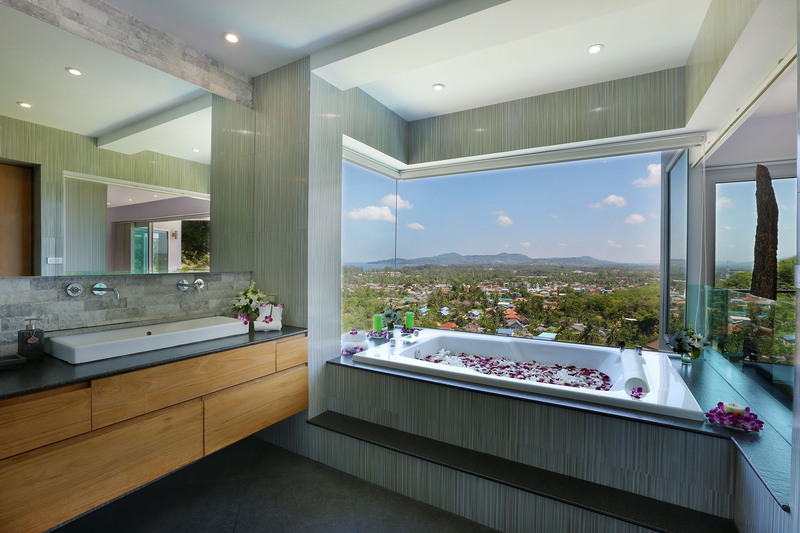 The villa has its own massage room with amazing views, however if you prefer more privacy then treatments can be carried out in your bedroom suite. 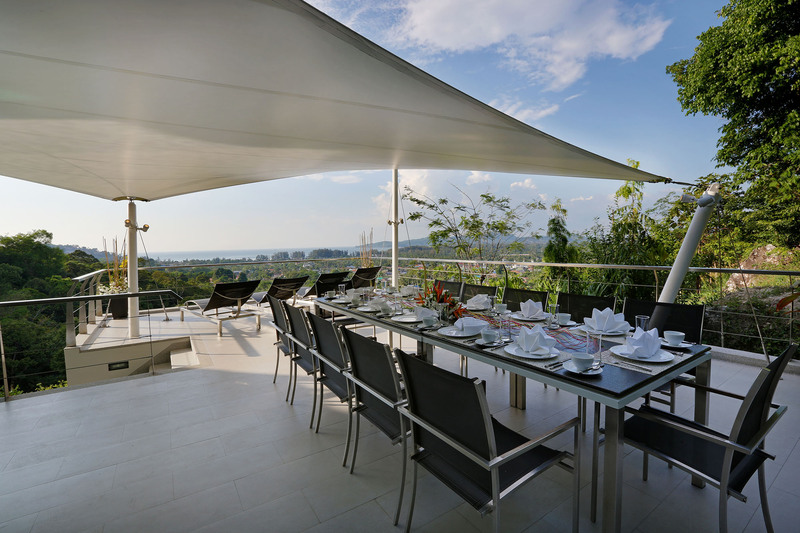 The villa set on a lush green hillside and facing the Andaman Sea with short drive from Bang Tao and its long stretch of fine sand, the villa is reached by a private road and is an idyllic setting for couples, friends, and families to holiday. 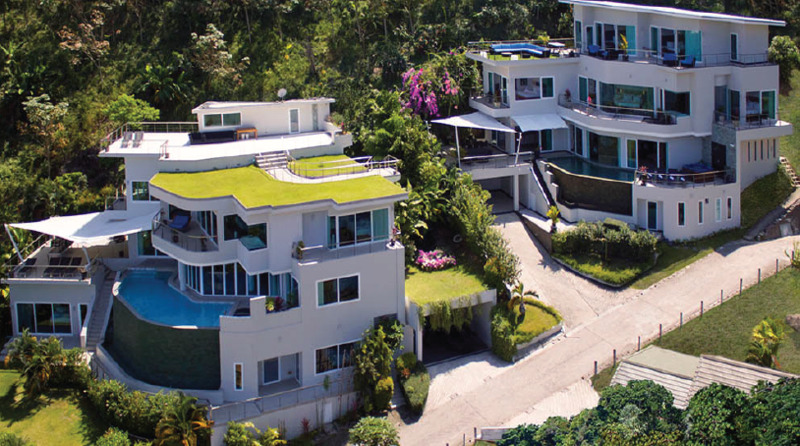 Villa Namaste wraps itself around the lush green hillside and has the most stunning views overlooking Bang Tao and Andaman Sea. 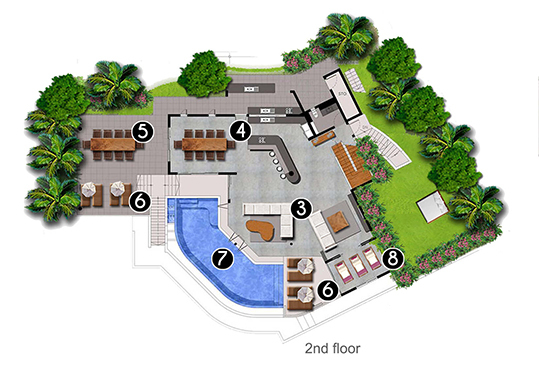 This six-bedroom luxury private villa is brimming with style, luxury, comfort, and calm ambiance. An infinity pool, spectacular rooftop entertainment area attended team of welcoming staff who ensure a restful and luxurious stay for the best the villa-living experience The villa set on a lush green hillside and facing the Andaman Sea with short drive from Bang Tao and its long stretch of fine sand, the villa is reached by a private road and is an idyllic setting for couples, friends, and families to holiday. 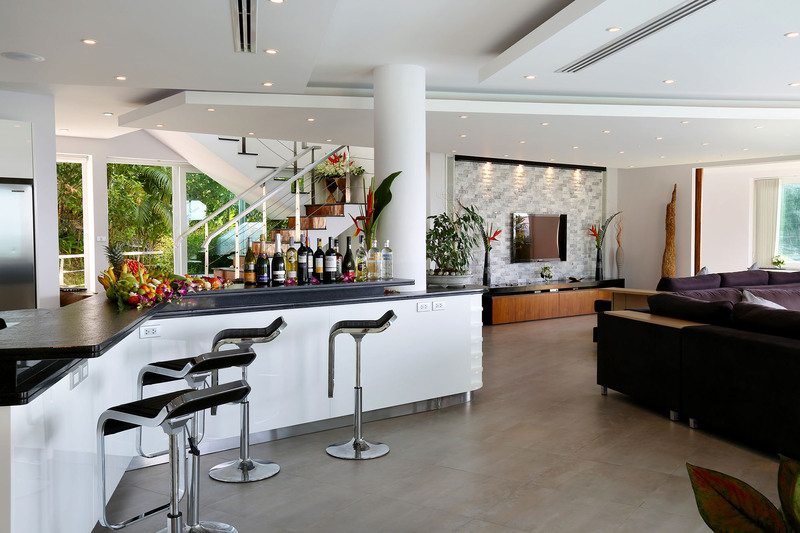 Villa Namaste’s open-plan living area extends generously across the second level and featured comfortable sofa seating, a 12-seat dining table and a fully equipped, sleek, modern kitchen with breakfast bar. 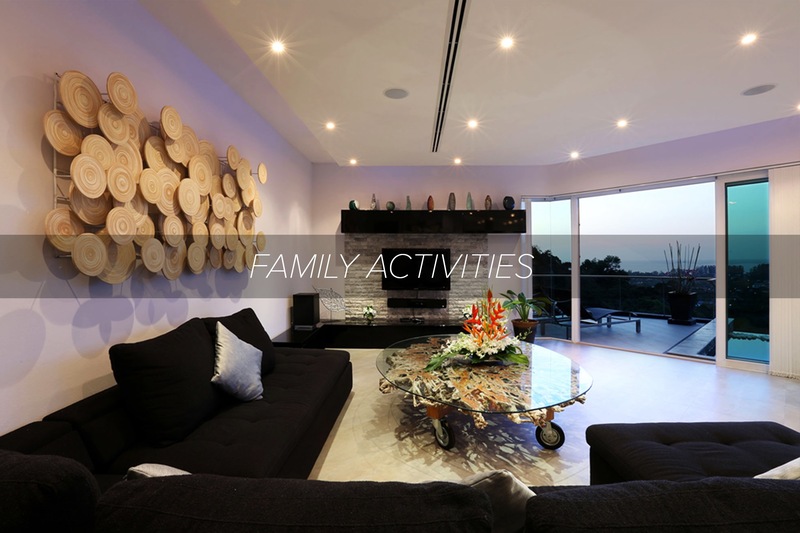 A large wall-mounted television provides family entertainment and mesmerizing views flood through the vast glass frontage that opens to the infinity pool, sun deck and outdoor dining area. 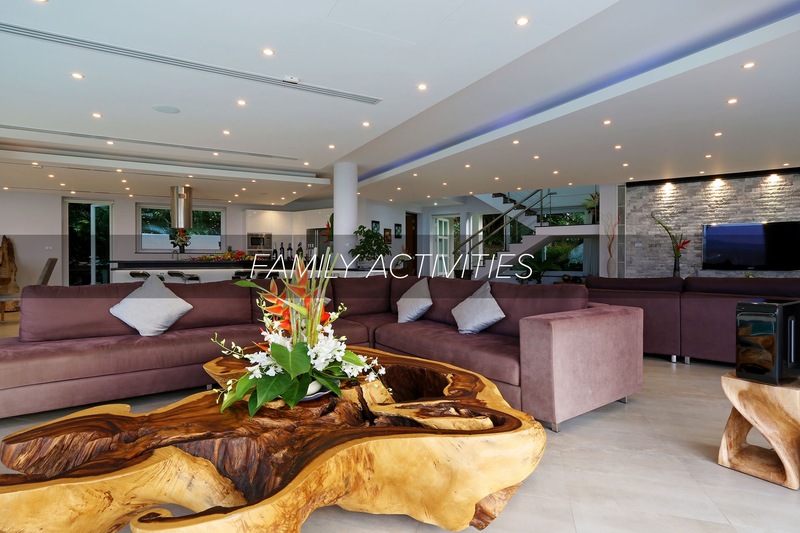 Villa Namaste’s open-plan living area extends generously across the second level and featured comfortable sofa seating, a 12-seater dining table and a fully equipped, sleek, modern kitchen with breakfast bar. A large wall-mounted television provides family entertainment and mesmerizing views flood through the vast glass frontage that opens to the infinity pool, sun deck and outdoor dining area. The rooftop bar is the place to mix delicious cocktails and raise a toast to another perfect day in Phuket. As the sun sinks below the horizon, relax back on a sofa to watch the stars come out before sitting down to a gourmet dinner prepared by the villa’s skilled Thai chef. At this height, surrounded by tropical sounds and breathtaking views, Villa Namaste is a very special place for a celebration or intimate wedding. 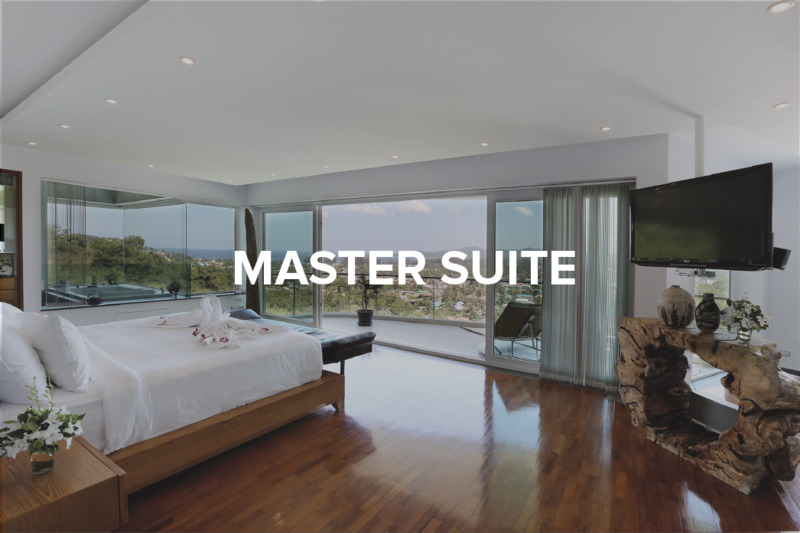 Villa Namaste’s centrally positioned second floor master suite is ample, intimate and elegant, with a larger private sundeck from which to admire the vista. 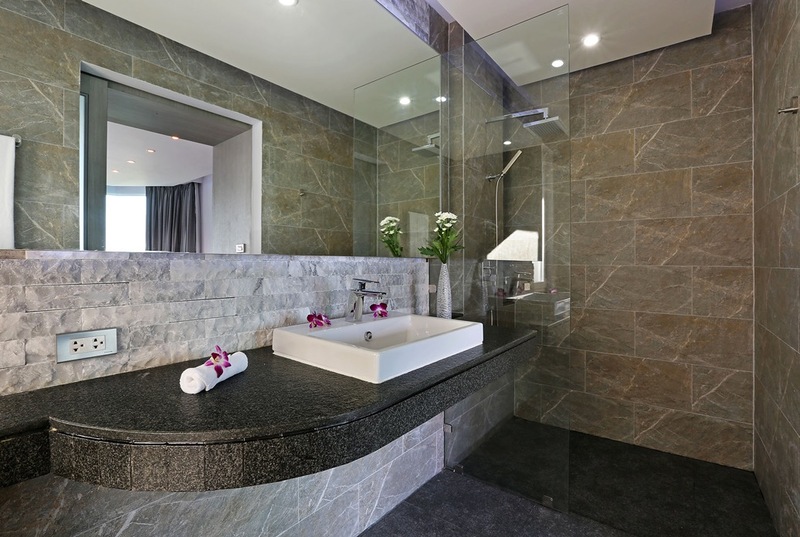 The ensuite bathroom boasts a sea-view Jacuzzi bathtub and a spacious walk-in dressing room. 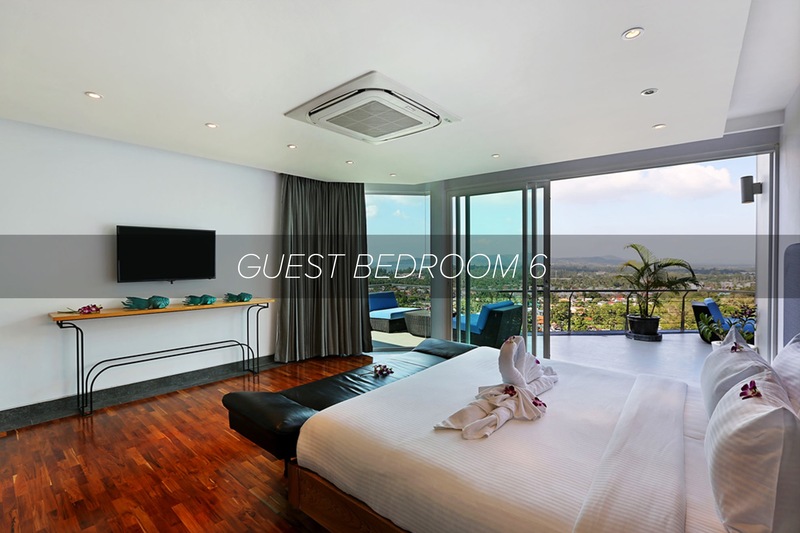 Two guest-suites are also situated on the second floor, as well as a comfortable media room, which can be converted into a further bedroom (with either twin or a queen-size bed) if required. 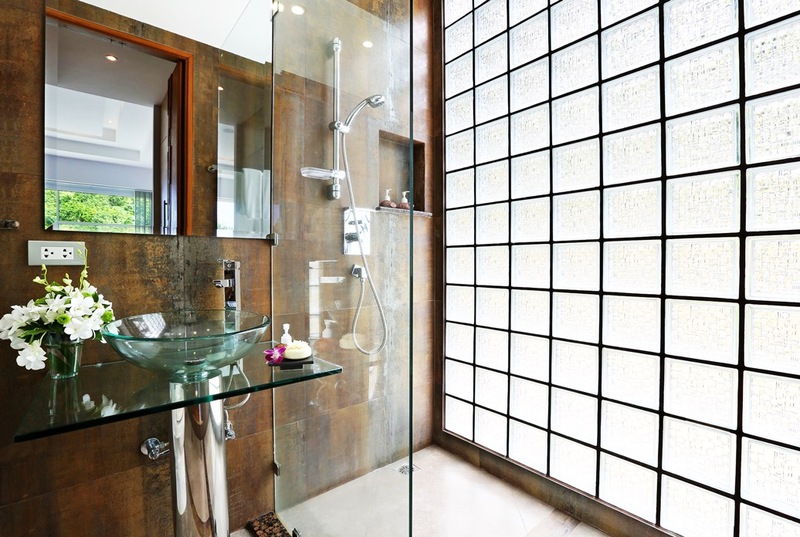 The villa’s design is such that none of the guest suited on this floor have connecting walls, so privacy is exceptional. 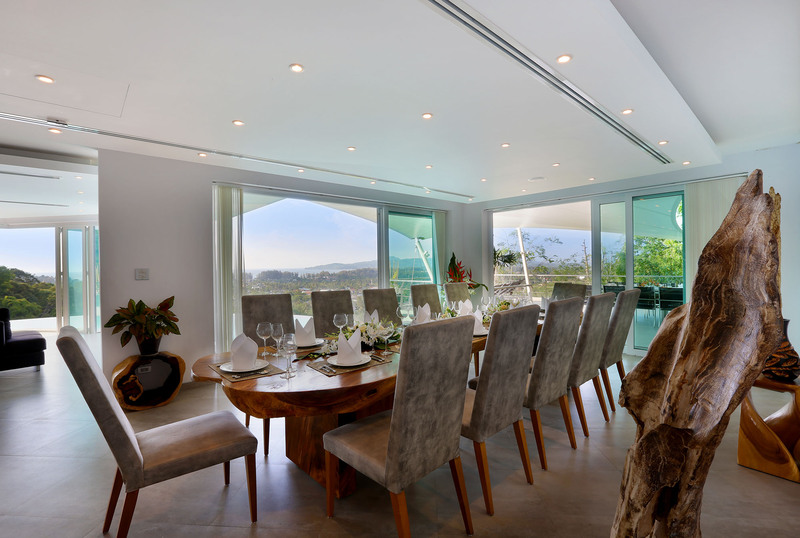 The two guest suites offer stunning mountain and sea views from their private balconies, whilst a large window in the media room overlooks the garden. Up on the rooftop are two more guest suites, each with en-suite bathroom. 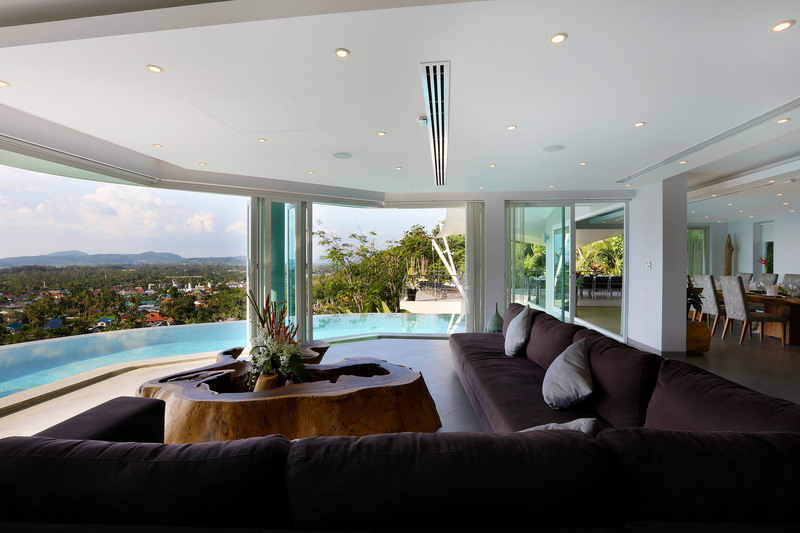 Both rooms share wide balconies and seating for admiring the view. 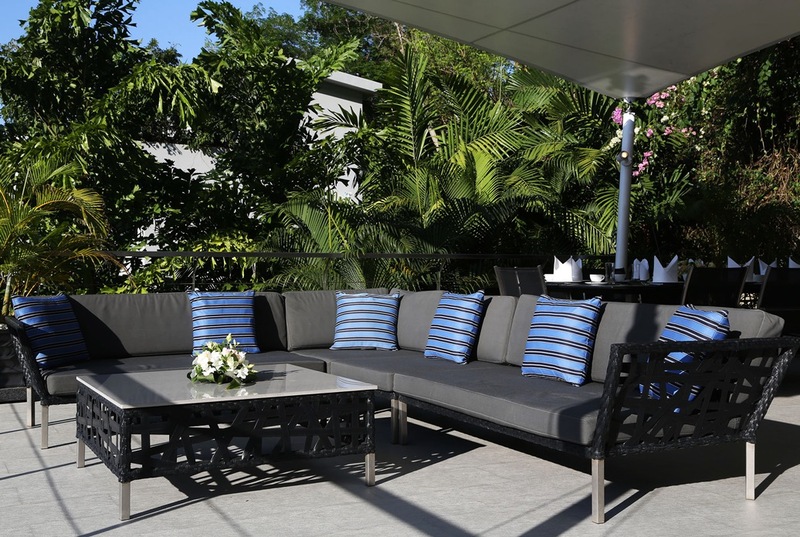 Just a few steps away, guests can sit and relax in the rooftop lounge for cocktails during sunset. long with breakfast and drinks. A full wine, spirits and soft drinks menu is also available. 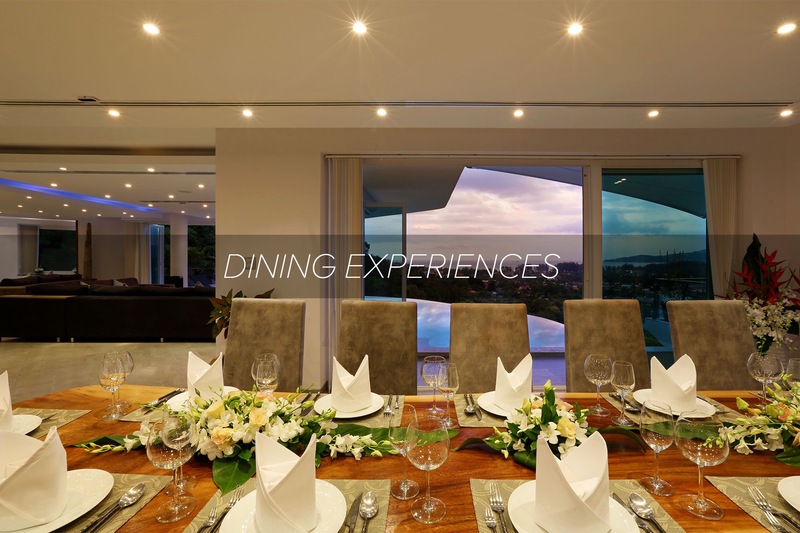 Guests are encouraged to plan their meals together with the villa chef, ideally a day in advance to allow time to buy groceries and pre pare meals. 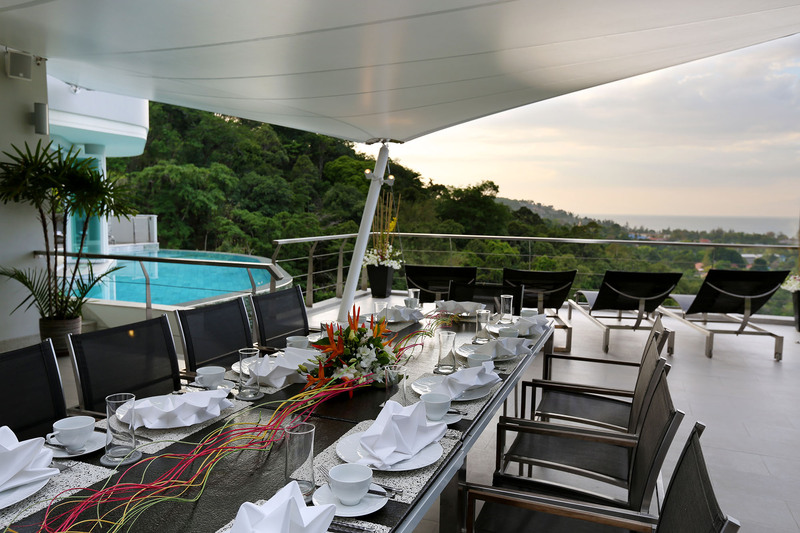 VIlla Namaste activities are tailor-made for a legendary celebration you and your buddies will never forget. 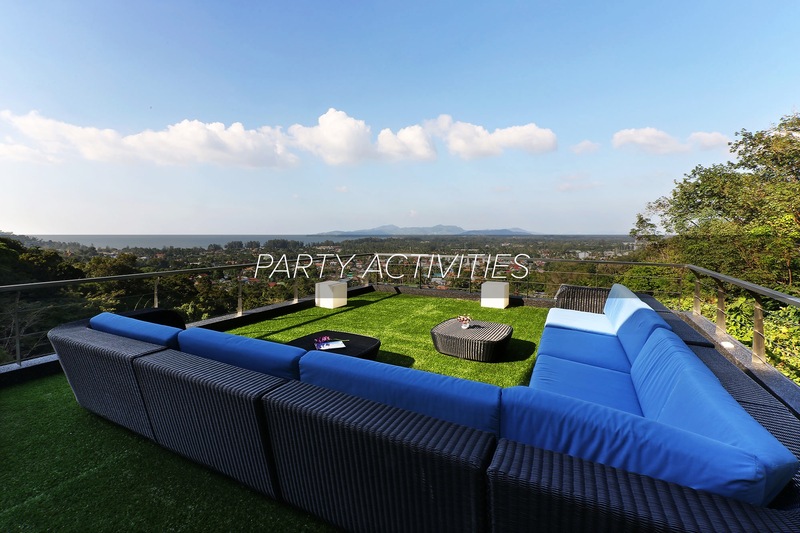 As you prepare for your big night, you can stretch out in a lounger, knock back some beers while relaxing in the pool, or simply take in the stunning views or even make BBQ dinner on the rooftop. Add a healing touch to your stay at Villa Namaste with a soothing in-villa massage or beauty treatment. 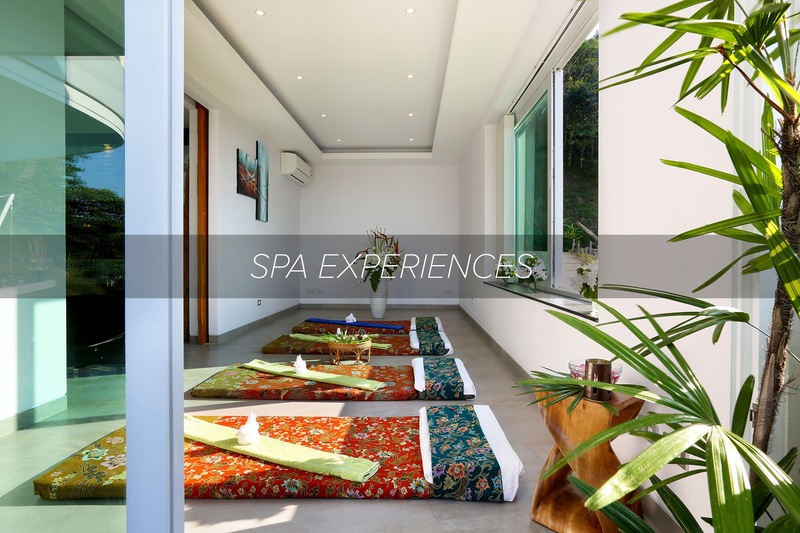 Relaxing spot to enjoy a private spa or beauty treatment. Whether you’re in the mood for a poolside pedicure or an invigorating Thai massage, just ask our staff to bring the spa to you! 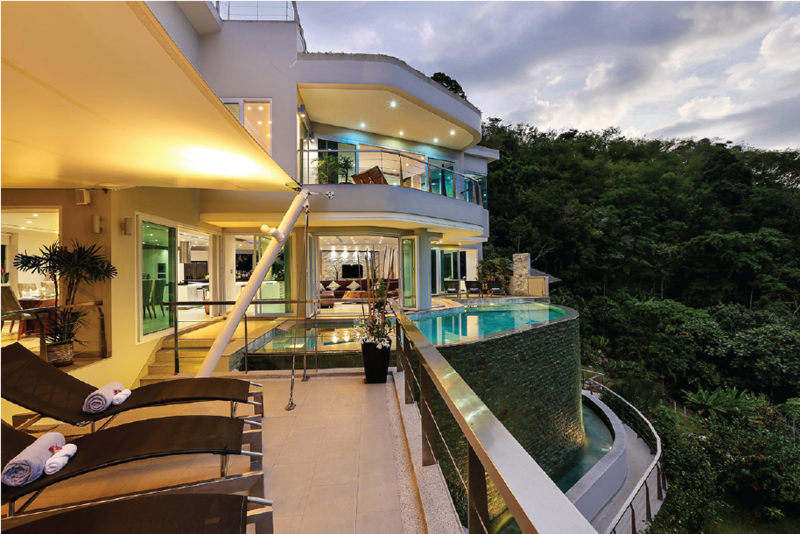 Villa Beyond, a seven-bedroom luxury private villa is located next door to its sister six-bedroom Villa Namaste, set on a lush green hillside and facing the Andaman Sea. 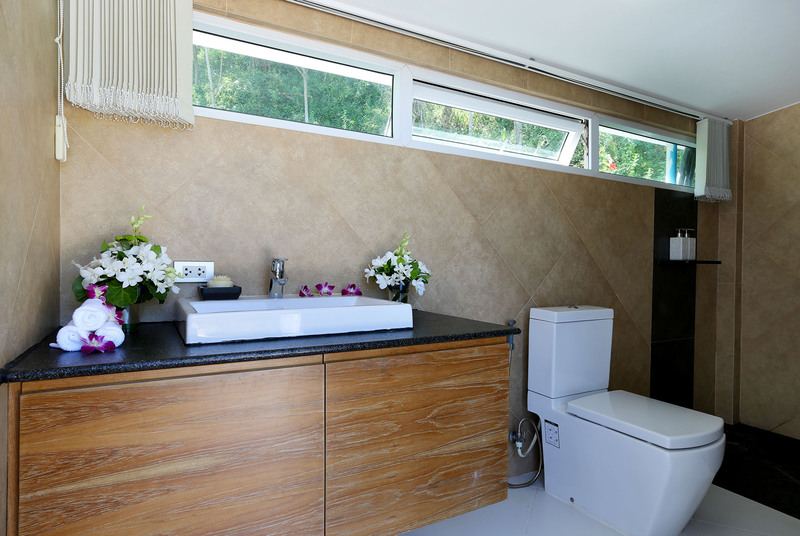 Both spacious modern villas have plenty of style, luxurious comfort and privacy with a calm and serene ambiance. Add to the mix a stunning infinity pool and friendly staff team, including a personal chef, and life is beyond perfect. Guests at both Villa Beyond and Villa Namaste have the full attention of a team of four staff, including a villa manager, Thai chef and housekeepers. 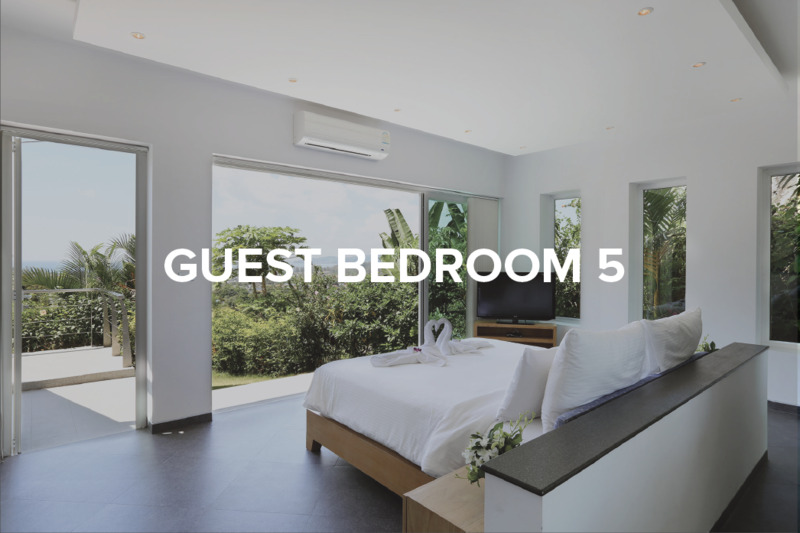 Guests are invited to let the villa manager know if they would prefer the staff to be present at all times or to be available on a more discreet basis. 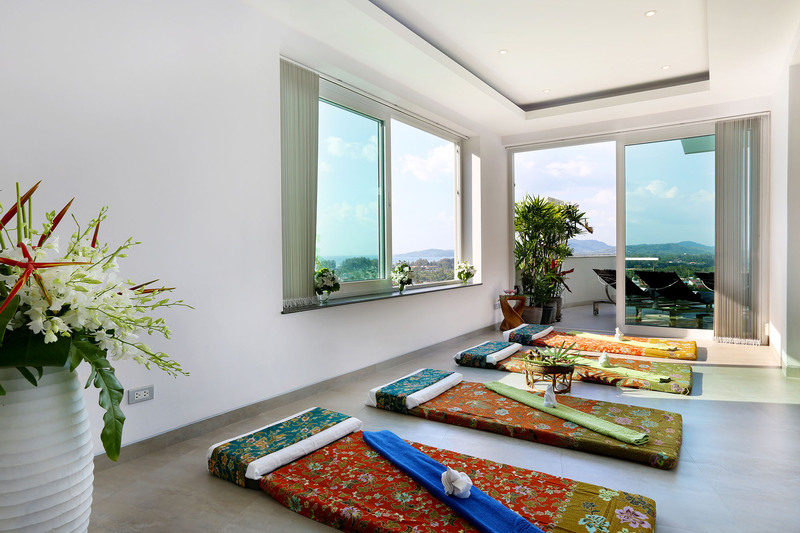 Add a healing touch to your stay at Villa Beyond & Villa Namaste with a soothing in-villa massage or beauty treatment. Check the spa menu for a session. Villa Beyond & Villa Namaste are an idyllic destination for families holidaying together, particularly families with older children, who will love spending their days by the pool chilling to the sounds of the SONOS music system. Along with breakfast and drinks. A full wine and spirits menu is also available. The chef is happy to make suggestions for Thai dishes, and will shop at local markets for the freshest ingredients. 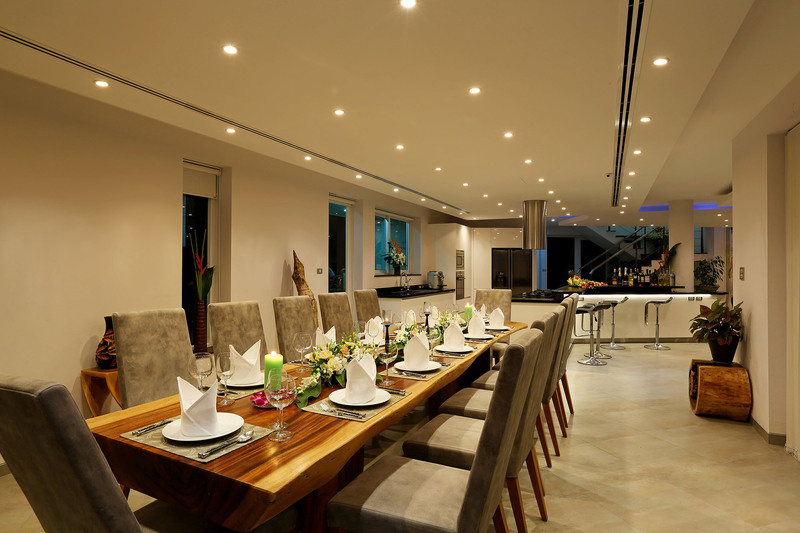 If you have any special requests or dietary needs, just let the chef or villa manager know. 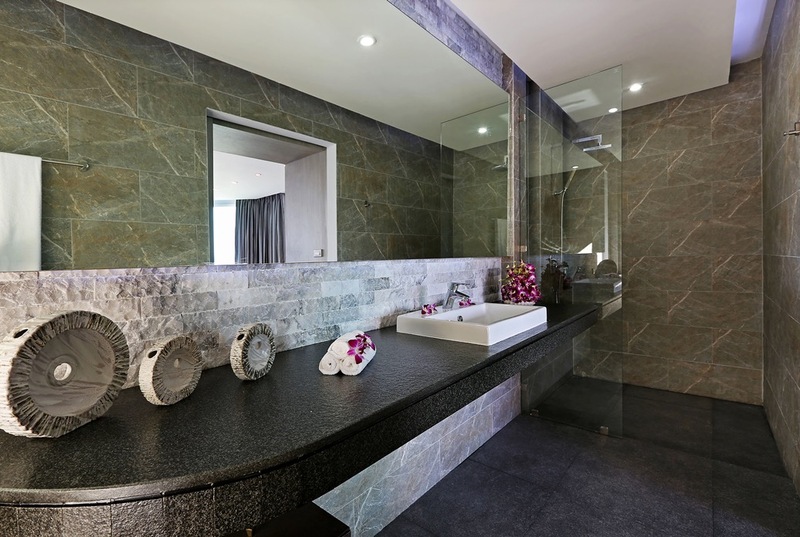 Guests at both Villa Beyond and Villa Namaste have the full attention of a team of four staff, including a villa manager, Thai chef and housekeepers. 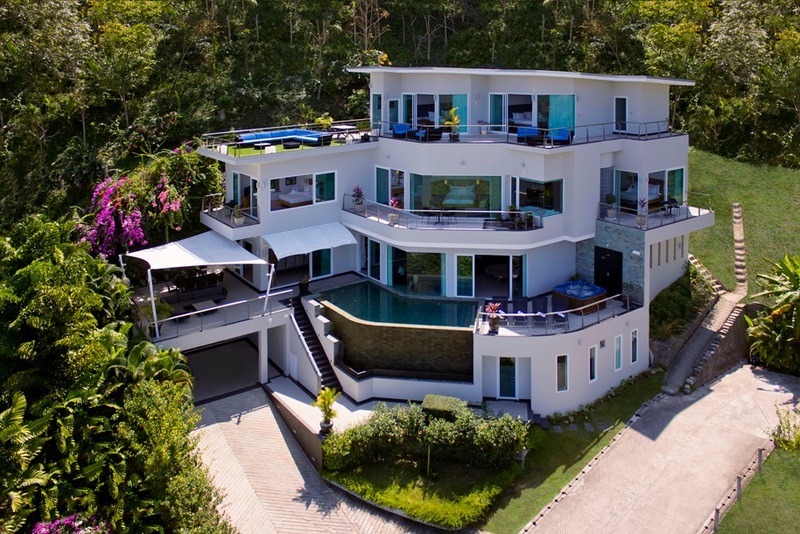 Guests are invited to let the villa manager know if they would prefer the staff to be present at all times or to be available on a more discreet basis. 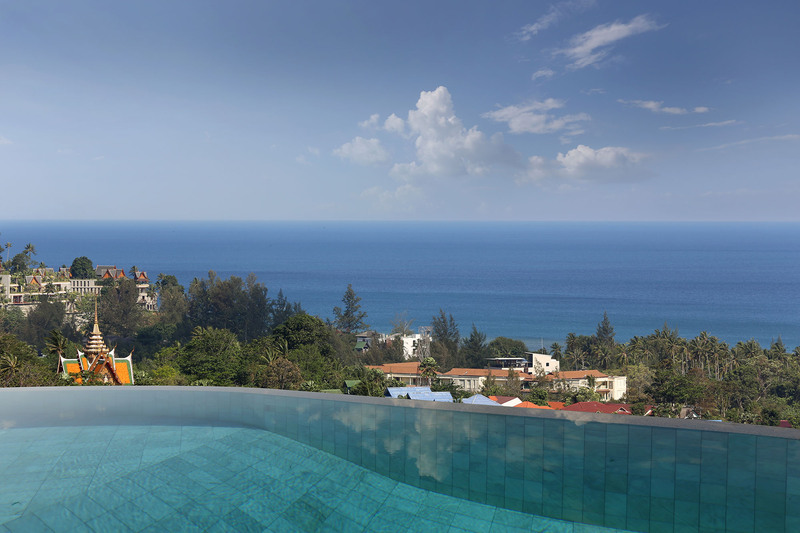 Set on Phuket’s west coast, the villas are just a short ride from the village of Bang Tao, a traditional fishing village with a strong sense of community and a long beautiful sandy beach. 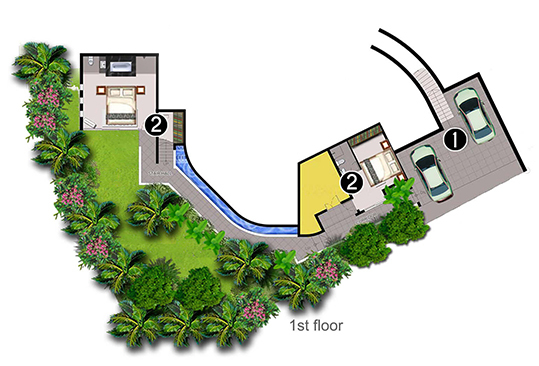 A steep road, shared with just three other properties, leads up to the villas. Surrounded by lush tropical flowers with the mountain as a back drop the villa is striking and quiet, disturbed only by the sounds of village life from below. 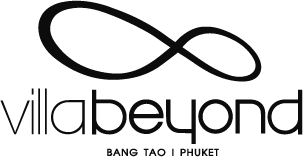 Bang Tao offers a plethora of activities to enjoy, from mini golf to beach clubs offering all day dining with occasional live performances and international music acts. Bang Tao village is a peaceful residential area populated mostly by fisherfolk where life revolves around a big golden-spired mosque. There are no stores or services in the village, so car hire is essential for shopping trips, dining out and exploring the island. Amazing place with amazing views. 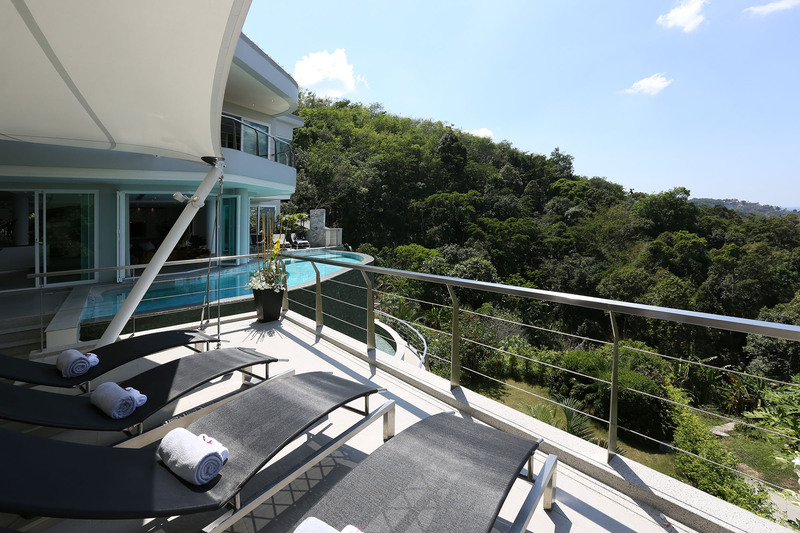 The minute we arrived we knew we chose the right place, set at the top of a hillside with fantastic panoramic views over the andaman sea in one direction and lush jungle/forrest in the other direction. Everything in the villa is exactly as per photos and every service you can imagine is available through Oi the villa manager (she is an absolute gem). This villa is not someone's home it is specifically set up as a luxury villa rental so everything is well maintained and cleaned daily. 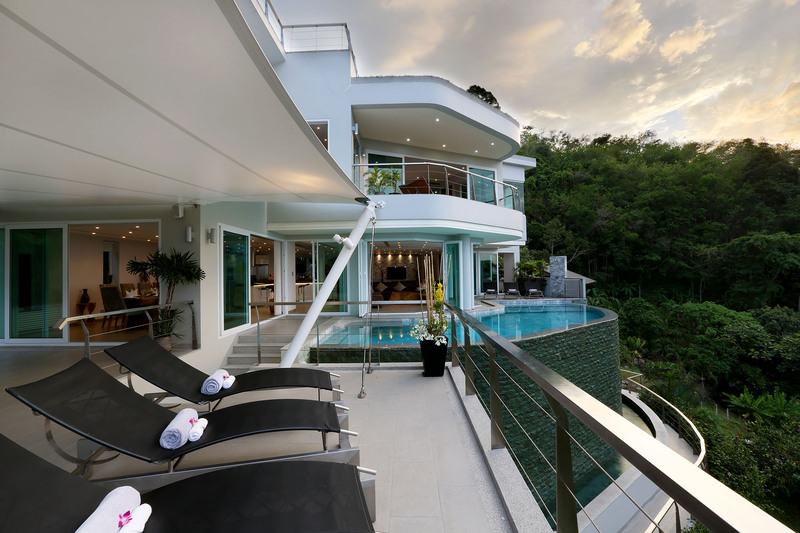 Could go on about so many great things but in short if you are looking for luxury and an exclusive place to stay in Phuket this is it. The property was the absolute hammer. 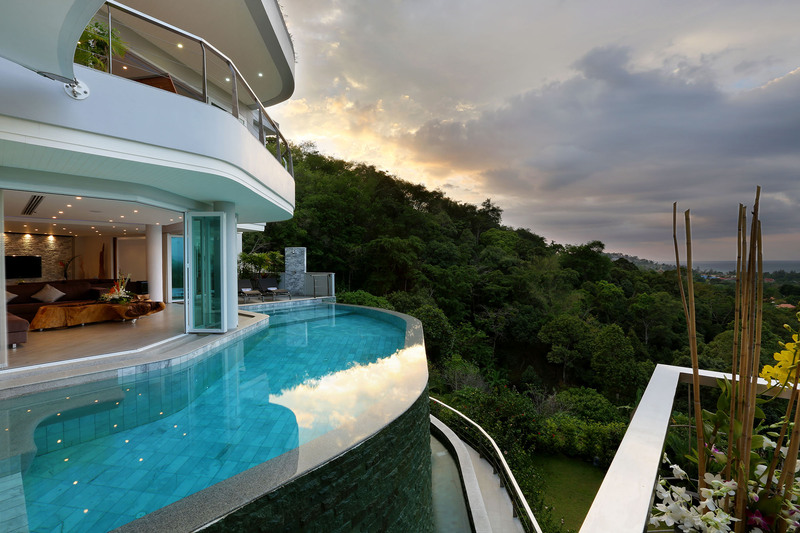 Whether it the view or the pool or the rooms in itself were. You can there relax or party make it is for both anything there. The care was from A to Z so nice and helpful. Cant wait go there again. I am more than satisfied with you and your staffs' excellent services. You were always attentive and willing to help us so that we could fully enjoy our stay and so were the other staffs. 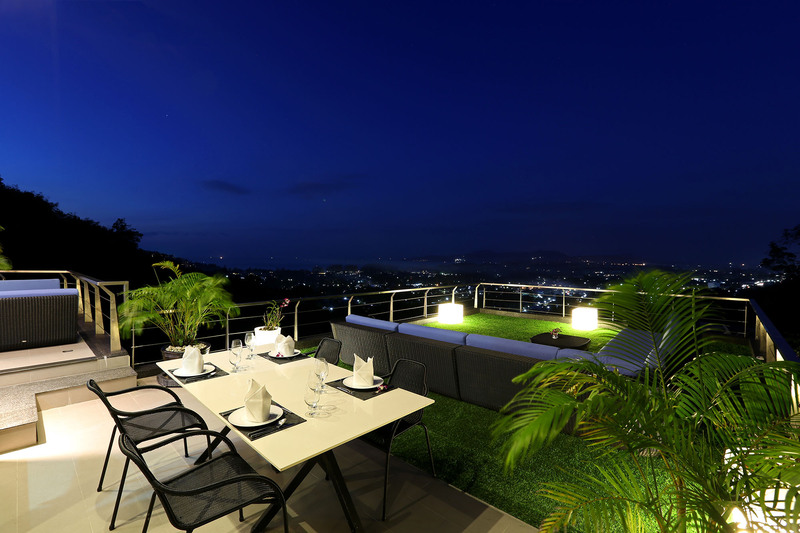 This rental terms and conditions is applied to http://www.villabeyondnamaste.com operated by Exclusive Villa Rentals Limited. Booking a Property is very different from booking a regular hotel room, please read the following conditions carefully. When booking the villa less than six months in advance, within 5 days of booking, a minimum deposit of 50% will be required. This deposit is non-refundable. If you are booking the villa more than six months in advance, a 25% deposit is due within 5 calendar days of booking. The additional 25% of the deposit will be requested 6 months prior to your stay. Payment is due in full 45 days before your expected arrival date. 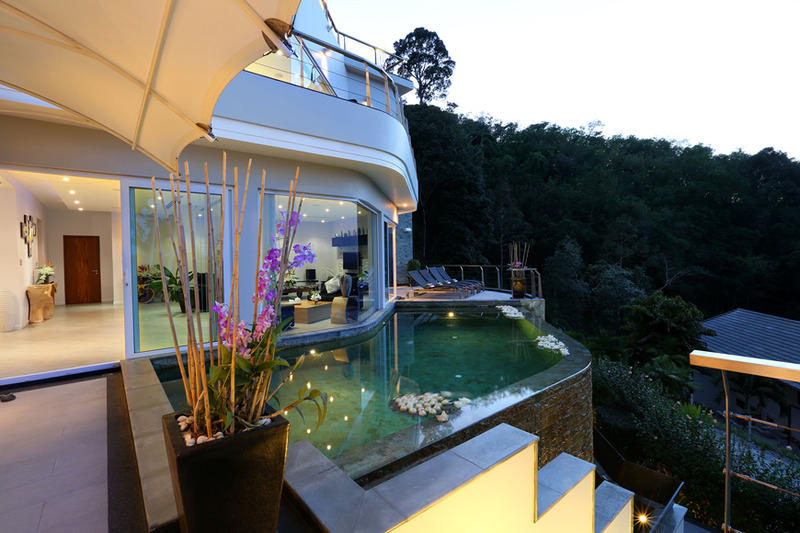 No contract will exist between the guest and villa owner until receipt of funds. 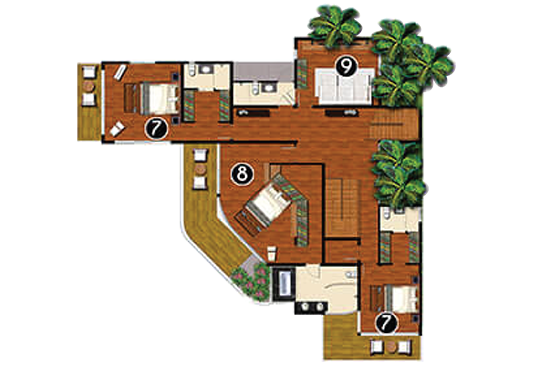 If funds are not received within 5 banking days the reservation shall be deemed to have been cancelled and Villa Beyond Namaste or the villa owner reserves the right to allocate the Villa to another client. If the required deposit payment is not received within the 3 working day period, Exclusive Villa Rentals reserves the right to void the Guest’s booking request. If payments are not made on or before the due dates as required herein, the Owner or the Owner’s Representative may cancel the booking, in which case this Rental Contract will be thereby terminated without any further notice required. Cancellation charges may apply as detailed below. The cost of electricity, Wireless Internet, mains water, cleaning and garden supplies, and local taxes are included in rental rates. Only provisioning costs plus 20% surcharged of shopping bill will be the Guest’s responsibility. Gratuities for household staff are encouraged and normal, but are left entirely to the Guest’s discretion. Once full payment is received, guest will be contacted for flight details and airport transfer arrangement to the property attached with reservation voucher. This voucher, along with the Guest’s passport, need to be presented upon arrival. 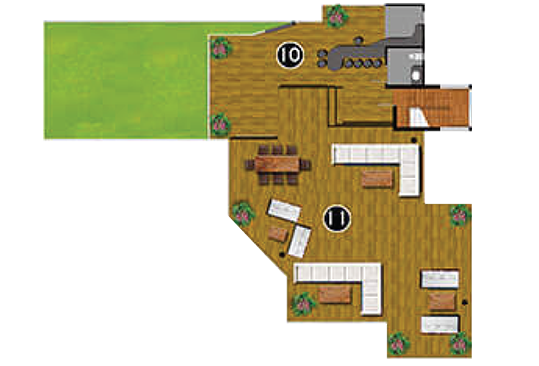 Typical check-out and check-in times are 12:00 noon and 3:00pm, however we will try to work with the Owner or Owner’s Representative to try to accommodate the Guest’s actual arrival and departure times, subject to availability. A Property is someone’s home. Please treat the Property rented accordingly, and leave the Property and all its contents in good order and in an acceptably clean condition. 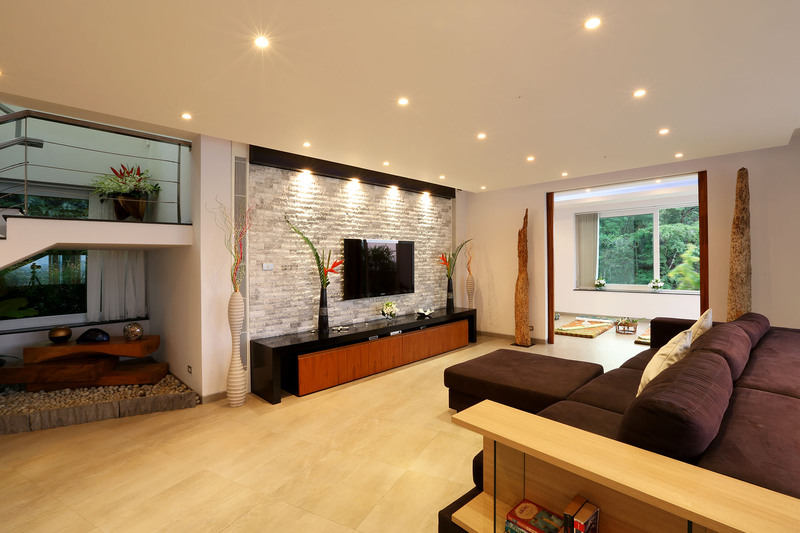 Any damage or losses caused during the Rental Period, as well as any special cleaning requirements will be the Guest’s responsibility and may be charged to the Guest’s account and deducted from the Guest’s security deposit. 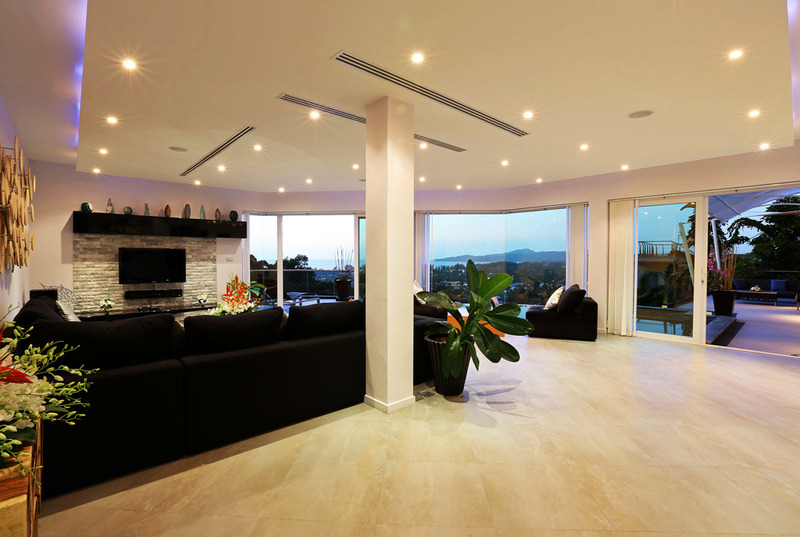 In cases of excessive or unacceptable loss or damage at any time during the Rental Period, the Owner or Owner’s Representative may require the Guest and their party, including visitors to vacate the Property immediately, without compensation or refund. The Property and its facilities are available for the Guest’s full enjoyment during the Rental Period. However the Owner, Owner’s Representative, or other staff and contractors may need access to the Property from time to time (e.g. 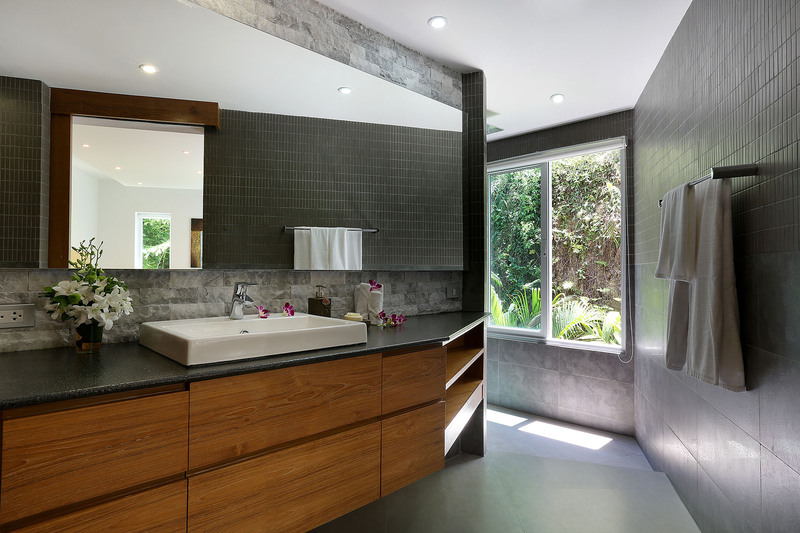 for maintenance purposes to the house, garden, swimming pool, utilities and services, or for the purposes of providing additional services requested by the Guest, etc.). 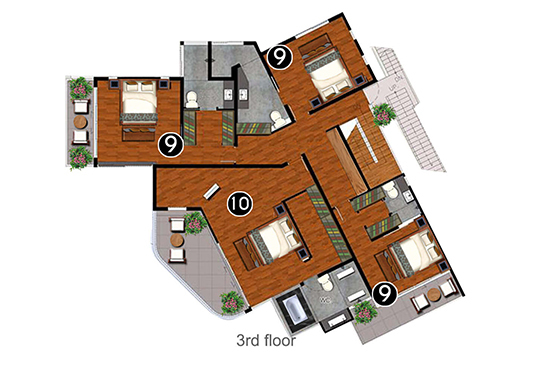 The Guest is required to give them reasonable access to the Property for these purposes. Only the specified number of persons listed in the Rental Agreement at the time of booking may reside on the premises. The number of registered guests given at the time of the booking is the maximum number of persons allowed. 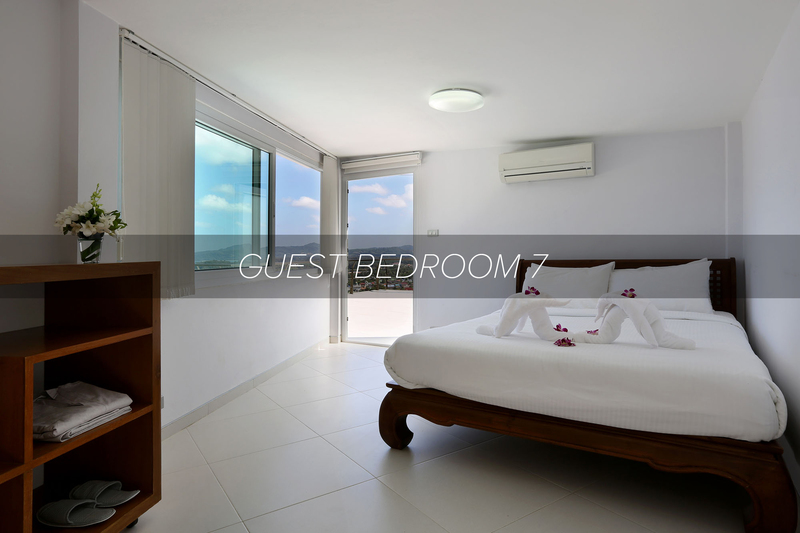 If the Lessor or a representative of the Lessor will find out that an additional number of guests are staying at the property, it is the absolute discretion of the Lessor or the representative to ask the extra person or persons to vacate the premises. Otherwise, each additional person will be charged a published rate of $300 USD per night. There is a minimum 2 days during summer season and 3 days stay requirement for most of the year. During peak seasons (Christmas & New Year), the minimum stay is from 7 to 10 days. For holidays such as Easter and Chinese New Year, the minimum stay is 5 days. This may not be applicable to some villas. 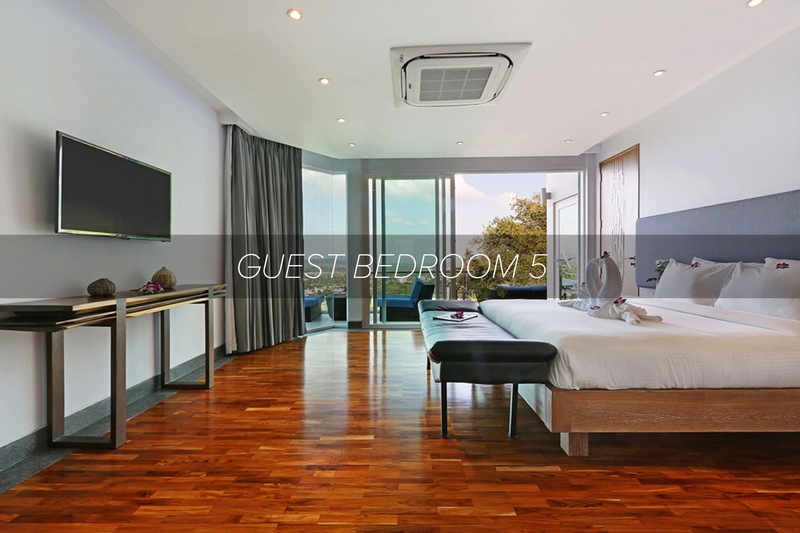 All bookings are assumed to be for normal holiday purposes only, and the Guest agrees that the use of the Property will be limited to this purpose unless otherwise confirmed in writing. 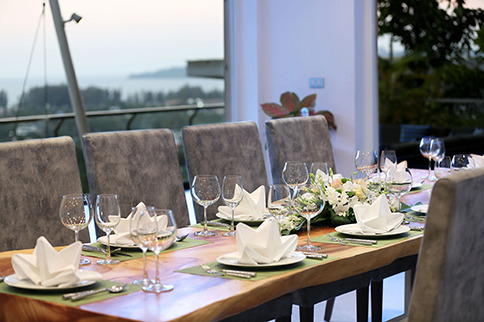 If the Guest is planning to hold an event, such as a wedding or party, which involves having exceeded maximum number of guest allowed at each villa, guest needs to pay USD 1,500 as an event fees with an extra USD 3,000 for security deposit, which will be returned after the event. The cancellation will take effect from the day the written confirmation is received (email acceptable). The following cancellation charges will be applicable depending on when the notification of the cancellation is received in writing and the period of stay in the Villa. A) If the Lessee cancels the reservation 45 days or more prior to arrival date, all payments are forfeited but credited for 9 month from the date of the cancellation confirmation by the Lessor. The credit value can be used by the Lessee or anyone on his or her behalf for any reservation, during any period upon availability and solely for the villa initially reserved. C) Christmas and New Year Period, for any cancellation after the deposit and/or balance payment, all payments are forfeited. However, a full or partial refund is solely applicable in the event that the Lessor secures another reservation covering partially or fully the initial and cancelled reservation. The above cancellation charges also apply if the Lessor cancels the booking due to non-payment of the balance. Once a booking confirmation, a fee of USD 50 will apply to each amendment made. 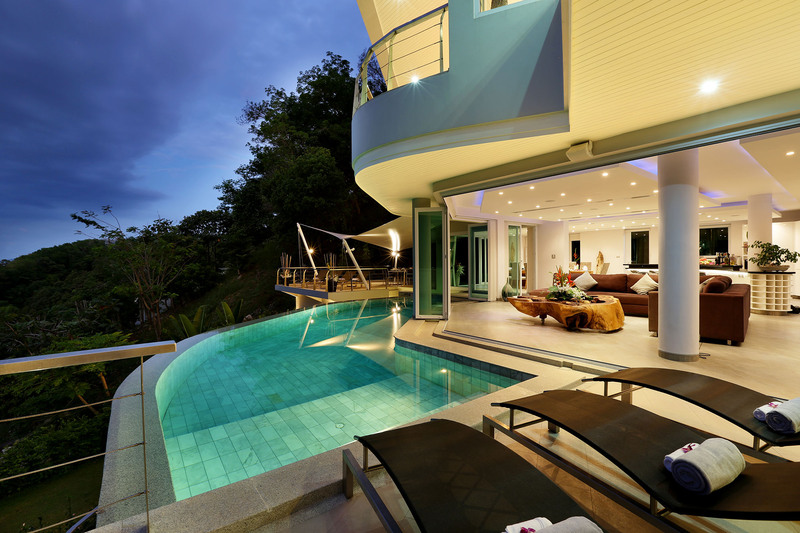 Exclusive Villa Rentals will do its best to accommodate any reasonable amendments, but the Guest should be aware that some changes may not be possible. 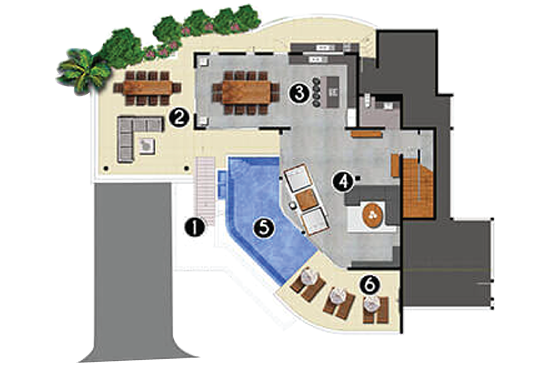 All villas come with staff service during your stay at the villa. Additional services such as babysitting and drivers can be arranged by our concierge team before arrival and are subject to availability. The Lessee must allow staff such as pool maintenance workers and gardeners access to the grounds in order to complete their work. There is a ‘No Pet Policy” in the villa and on surrounding properties. Unless with prior written permission. Strictly no smoking permitted in the villa. Smoking must be done outside, where an ashtray is provided. All food and beverages purchased on behalf of the guests are charged at a price of cost plus a 20% surcharge that covers food preparation, transportation, time involved in the shopping and cooking process, and the use of the kitchen. Bills for food and drinks are expected to be cleared periodically and before departure. Linens are changed every third day, more often if necessary. Towels are replaced after placement in the towel basket. Additional charges may apply if more frequent changes are needed. Items such as bedding, washing, or clothing articles should not be hung where it is visible to another residence or common property on the estate. Laundry of personal clothing by a third party can be arranged at the lessees cost, the Lessor cannot take responsibility for any loss or damage by the third party. 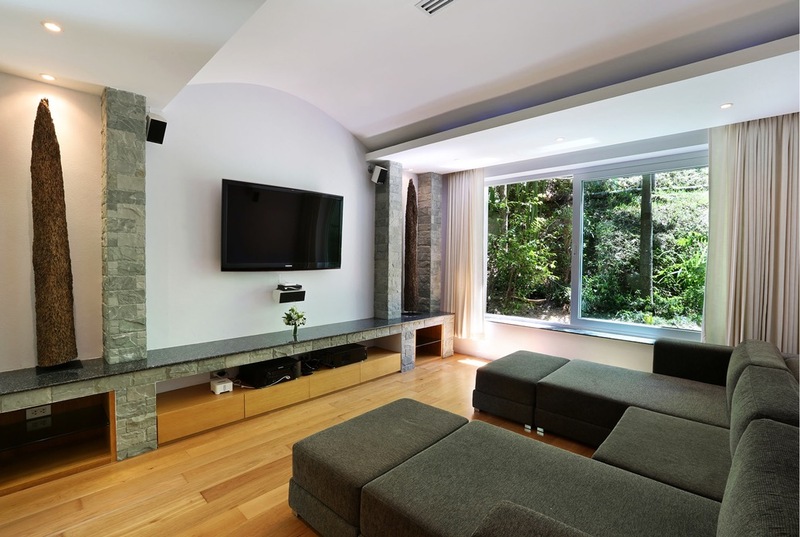 Properties are generally located in quiet residential neighborhoods. 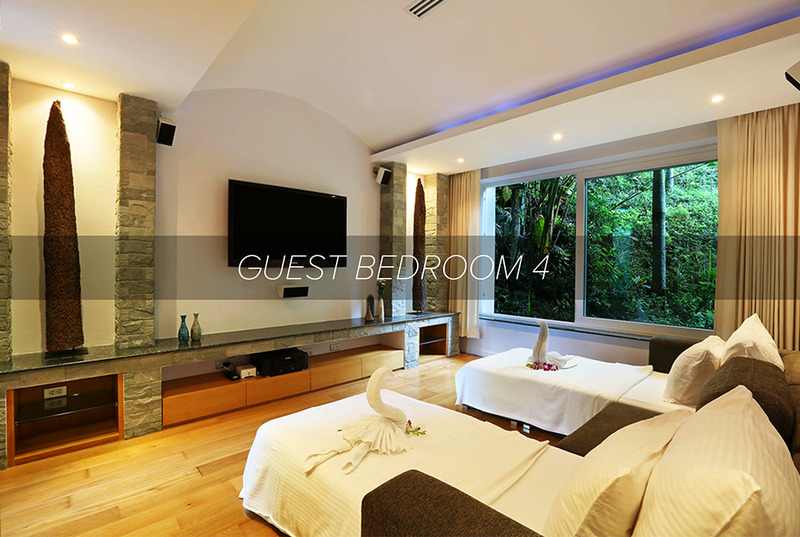 The Guest is asked to respect this, and ensure that all guests and visitors to the Property behave appropriately. Illegal or immoral activities including gambling, prostitution, prohibited drugs, possession or use of pyrotechnics or dangerous goods, and possession or use of firearms and other weapons are all strictly prohibited. Smoking is generally prohibited unless stated otherwise in the booking confirmation or reservation voucher. In the interests of safety, due care should be taken at the Property at all times, especially with children. Suitable supervision should be given around pools, beaches and roads, and when using all Property’s facilities. 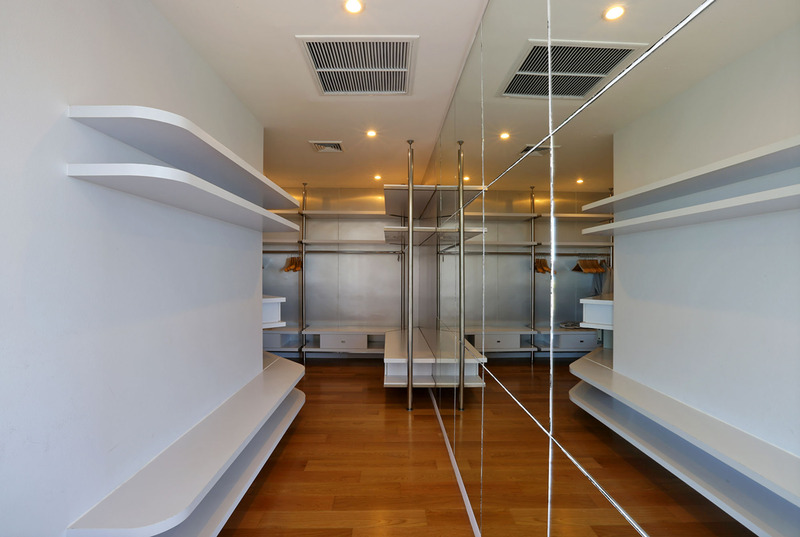 Any Guest valuables or property left or used at the Property are at the Guest’s own risk. Neither Exclusive Villa Rental, the Owner nor the Owner’s Representative accepts any responsibility for loss of or damage to Guest property. 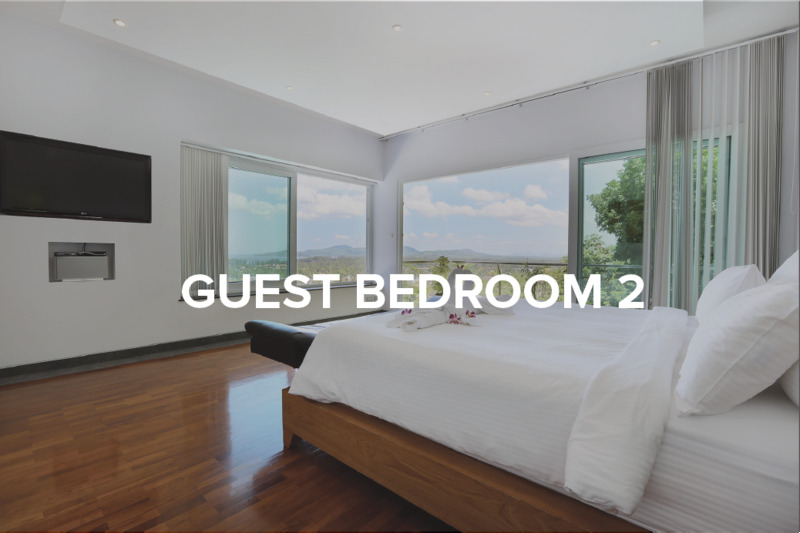 The Guest is responsible for the Property during the Rental Period, and must ensure that all windows and doors are locked securely when not on the premises. Any act or omission by the Guest, their party and/or visitors which may negate or prejudice the Property’s insurance policy and/or results in loss or damage is the Guest’s responsibility. Any problems or complaints that occur during the rental period should first be discussed with the local staff. 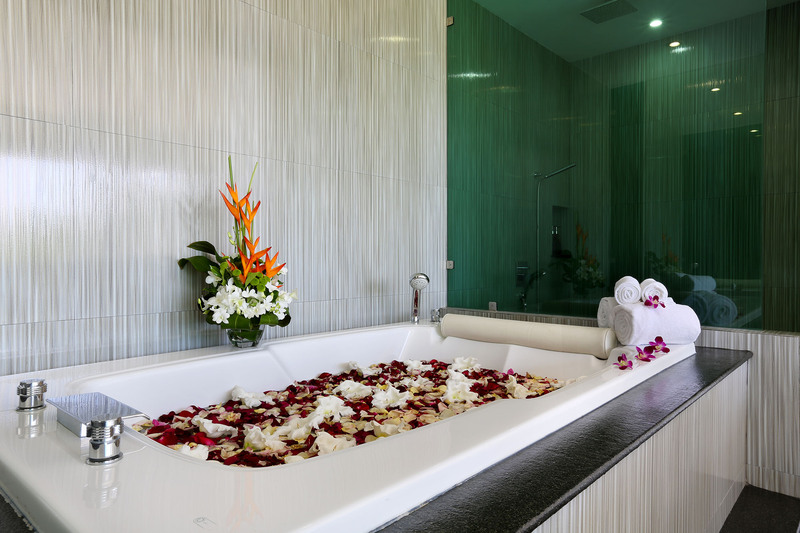 If the staff is unable to quickly resolve the issue, please consult the Villa Concierge Team, who will rectify the situation to the best of their professional ability. 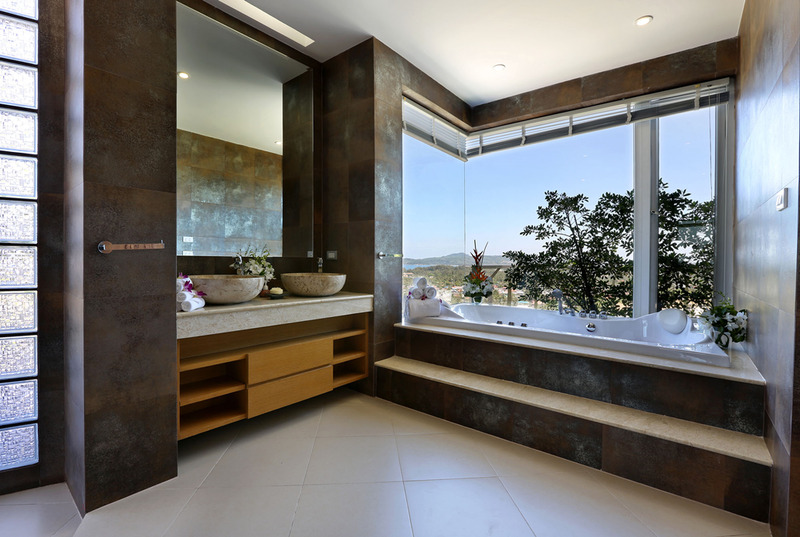 The Lessor is not responsible for such issues as interruptions to water supply, electricity, Internet connection, cable TV, or breakdowns of lifts or pool filtration systems. The Lessor will do everything within reasonable expectation to avoid complaints in the first place, and it is understood that when staying in a less developed remote resort location, that infrastructure, local standards, and conditions are typically less developed than in urban environments. Any complaints should be written and given to the Lessor within 24 hours of the time the issue occurred. Any contract that is made will be with the acceptance by both parties of these terms and conditions, which are governed by the local law of the property rented and both parties will submit to the exclusive jurisdiction of the local courts of the property rented.